This is a small manual bending machine,popular for those wanting to create specific products with small profiles. It has technical features which make it versatile because of its single driving roll and two adjustable bottom rollers allowing you to make changes to the diameter. 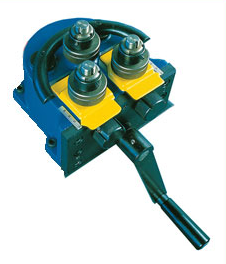 the machine is supplied with a set of universal rolls. Special rolls can be manufactured according to the profile to be bent. It is manufactured from very strong ribbed cast iron, the lower rolls are mounted on straight slides made from hardened steel. It can be fixed to a vice or on a machine base, which can be supplied on request.